since completing the Employment Works program Grant Associates, a national workforce development provider, operates in downtown Brooklyn. 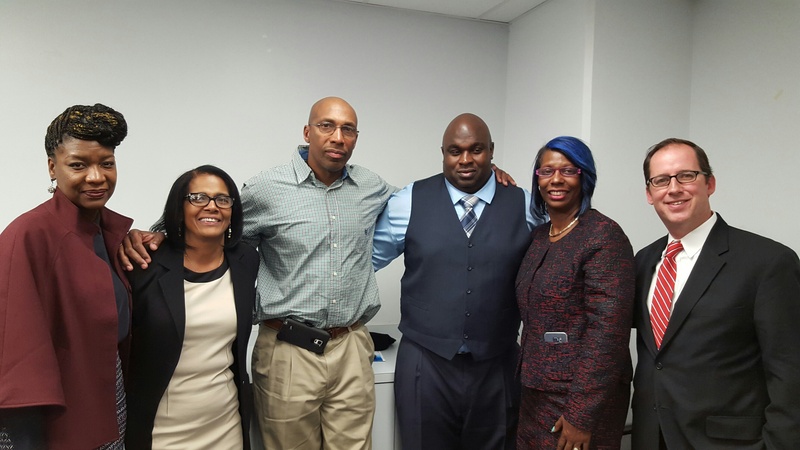 Funded by the NYC Department of Small Business Services, Employment Works is solely dedicated to helping justice involved individuals re-enter the job market. Alumni of the program, the guest speakers had returned to the Employment Works office for the program’s annual holiday party on Dec. 9 to celebrate the season, but more importantly, to motivate current members grappling with the struggle to reinvent themselves, return to the job market and create a stable life after years in prison. Proving to the world that they are not what society has labeled them is one of the toughest challenges most returning citizens face, Derrek Cain, a former program participant who now works for the Brooklyn Community Bail Fund, told the audience, a mix of former and current Employment Works members, Grant Associates staff and guests. Directed by Patricia Brooks, Grant Associates Vice President of Special Populations, Employment Works is known for its high success rate in placing returning citizens — some of the hardest to serve individuals — into jobs that provide financial stability and career advancement. Through a combination of high-touch career readiness preparation and coaching, peer group support, referrals to community partners for assistance addressing specific needs, and matching participants with employers who are background-friendly, the program has connected nearly 5,000 justice involved individuals with employment since inception in 2006. After completing the program, he was connected to a job with Baldor, a New York City-based food distributor, where he worked for seven years nurturing a dream of starting his own trucking company. In his third year of employment with Baldor, Mr. Walker passed the exam for the Commercial Driver’s License (CDL A and B) as the first step toward fulfilling that dream. Employment Works coached him about saving money and credit management, and then connected him with a lender to buy his first truck. He launched J&W Trucking, now in its second year of operation. “I had to be very patient,” he said. After finishing a 15-year sentence, Namon Ates said he was “blindsided” when he came out of prison. “I thought I knew it all.” Despite his past, Mr. Ates was able to launch a successful non-profit youth counseling program in Staten Island, but after his background was discovered, the program was shut down, he said. He found his way to Employment Works and attended the program’s five-day career readiness class, “Employment Essentials,” where he rediscovered his own potential and belief in his ability to turn his life around. Employment Works signed him up for an employer recruitment event and he was hired as a recruiting manager for Uncommon Goods, a Brooklyn-based catalog and online retailer. “Employment Works is a powerful platform for people who have nowhere to go,” Mr. Ates said. Anthony Lee, a program participant in 2013, said he still struggles with the choices he made in the past and knew he had to start taking steps to change his belief system. “I had to make some serious decisions – I didn’t want to die in prison and I didn’t want to hurt my family or cause harm to anyone else,” he said. Mr. Walker, whom Mr. Lee met while in prison, referred him to Employment Works, where the program taught him that despite the past, he could revisit old dreams and start fresh. Mr. Lee now works in construction in Long Island. Other guest speakers included Deldreana Peterkins, Director of Workforce Development for the NYC Department of Probation; outreach counselor Tamika Watts; Mychal Sledge, owner of the Sledge Group, a non-profit community-based organization that provides mentoring, tutoring and supportive services to youth ages 10 to 18 and their families in Harlem and the South Bronx; and Crystal McClelland, Grant Associates. From left: Deldreana Peterkins; Patricia Brooks; Anthony Lee; James Walker; Crystal McClelland; and Doug Cotter.